Half a year ago, on the morning when Seattle Symphony tickets for the season went on sale for non-subscribers, Gail and I selected two concerts we anticipated might be popular and bought tickets. One, with Bernadette Peters as special guest, I wrote about in October. The other, though sponsored by the symphony, wasn’t a symphony performance. 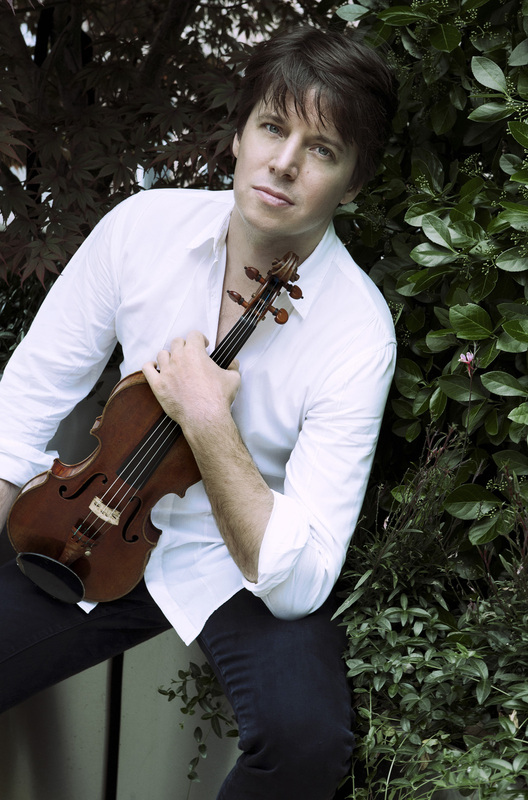 Rather, it was a recital by the violinist Joshua Bell, which took place four days ago. we arrived at 6:20. Not early enough. There’s only one eating option in the Boeing Gallery, the open space that runs inside the building along 3rd Avenue, with the Chihuly chandeliers on the north and south ends, elevators from the parking garage, coat check, and entry to the two theaters. Namely, Puck’s Café. (Puck as in Wolfgang Puck.) The website says you can “arrive early and enjoy a relaxing dinner or lunch before you attend the concert.” I suppose so, if relaxing means standing on line for 20 minutes, then searching for an empty table among the two-tops squeezed together in the Boeing Gallery, with tiny chairs, no separation from your neighbors, a view of busses and people standing in wait for them outside the window. But if we wanted to eat at a restaurant nearby, we would have had to arrive much earlier. So we got on line. I probably should have reviewed this passage sooner. We arrived a little earlier this time, around 6:10, but the experience was much the same. One reason not to head downtown too early on Wednesday was that the celebration of the Seahawks’ Super Bowl victory had taken place that afternoon. We feared getting caught in the tail end of post-jubilee traffic. And anyway, I was at work. We got there when we could. Same long line at Puck’s Café. Same difficulty finding a table. The dinner special this time was lasagna with green salad and a roll. We both chose it. Gail didn’t think it was so great. She’s probably right, but it was lasagna after all. I was happy. We took our seats around 7:00 PM, a half hour early. We were in Row F, six rows away from the stage, a ways left of center. This put our eye level about at stage height. We would be close to Bell, but looking up. Time passed, the hall filled, the lights dimmed, and out came Joshua Bell, with pianist Sam Haywood (and page turner). Haywood has his own successful solo career and, I gather, has toured regularly with Bell for some time. The first half opened with Giuseppe Tartini’s sonata known familiarly as “Devil’s Trill,” from around 1740. My memory of Perlman is that he made quite a dramatic showpiece out of the work. I wish I remembered better so I could more accurately compare, for Bell seemed to be playing an entirely different work. As would be the case throughout the evening, he played with what I might call a lighter hand, going less for drama and more for warmth. Not that Perlman isn’t warm, but everything about the evening felt gentler, more relaxed, and this applies equally well to Haywood’s approach on the piano. Bell plays a famous instrument, the 1713 Huberman Stradivarius. I couldn’t help but imagine, ignorant though I am of such matters, that perhaps Bell has adapted his style of play, or his selection of pieces, to fit the qualities of the violin. True or not, it’s certainly the case that the sound throughout was astonishingly beautiful. Dating from a decade after the popular “Kreutzer” Sonata, it is a far less sweeping or rhetorical essay than the previous showpiece. Indeed, in its comparative reserve and controlled emotion, the work demonstrates the same classical reserve as Beethoven’s contemporaneous Eighth Symphony. “Reserve” and “controlled emotion”. That summarizes the evening as a whole and captures the contrast I was trying to convey between this recital and Perlman’s. After intermission came Stravinsky’s Divertimento for Violin and Piano (after the Fairy’s Kiss). The Fairy’s Kiss ballet dates from 1928 and was composed to commemorate the 35th anniversary of the death of Tchaikovsky. “The resultant work … is a hybrid of original Tchaikovsky, with connective tissue and slightly ‘cleansed’ harmonies supplied by Stravinsky.” The divertimento came six years later and again was played with elegance and grace. The evening was still young when they finished, took their bows, and went off stage. Plenty of time for a series of encores. But on their return Bell told us there would be two and that’s all there was. As long as he had occasion to talk to us, Bell also made a Super Bowl joke, that being the theme of the day, then told us that he remembers the time when we had a good orchestra and a weak football team. Now we have a great orchestra, the best football team, and a world-class concert hall. People just love knowing they live in a special place. Or so I observed. This got the desired reaction. The view of him in the video is very much like our view Wednesday night. He assumes a stance facing to his left, so that we pretty much were looking at his right shoulder and the side of his face. The second encore, gosh, I don’t remember what it was. A short piece by some nineteenth-century violinist. I’d recognize it if I saw it written down in a list of standard encores, but it has completely slipped my mind. … one of the vanishingly few artists still able to sell out halls on their names alone. He is an old-fashioned performer in both his repertory and his restless, dramatic physical presence. Listening to him on Wednesday I wondered what heights of fame, record sales and talk-show appearances he might have scaled had he been born 30 or 40 years earlier. Which is not to say that he has gone unnoticed. Mr. Bell has been well known for long enough that it is tempting to take him for granted. But it would be a mistake to underrate him. In a program of Schubert, Strauss and Prokofiev sonatas, with morsels by Fauré, Sarasate and Tchaikovsky thrown in at the end, he proved once again that there is no better-sounding violinist. His tone is a wonder: rich and round from the top to the bottom of his range. The precision of his bow control allows for fine gradations of volume and touch. Mr. Haywood was an unfailingly elegant partner, from the clarity of his Schubert to his sober chords at the start of the final movement of the Strauss. He and Mr. Bell combined poignantly in their final encore, the Mélodie from Tchaikovsky’s “Souvenir d’un Lieu Cher,” the piece they performed for Mr. Cliburn in his final days. It would be wrong to call it restrained. It was moving, rather, because it pulsed with the extroverted vitality that is Mr. Bell’s trademark. He will never get Mr. Cliburn’s ticker-tape parade or million-record annual sales, but he plays with the same exhilarating passion. agreeably light touch prevailed in his well-attended recital at Benaroya Hall on Wednesday. The lightness was to be found not only in playing that emphasized a silvery sweetness over the sort of “fat” tone that some violinists cultivate, but also in the shape and content of the program he had devised. It’s that silvery sweetness that I was writing about earlier. A lovely evening.